We have a lot of exciting things going on in our diocese right now and, to reflect that, this year’s convention will not be business as usual! As part of our ongoing conversation about collaboration and innovation in the church, we will be welcoming the Rt. Rev. William Franklin and a large contingent from the Diocese of Western New York. Just two weeks prior to our convention, we will have sent a contingent to their convention (and there’s still time to sign up to join us! Visit our website to do so). They will join us for our entire convention and we will have ample time to get to know one another. Those that have attended convention in the past may notice that we will have a different emphasis for the content of our convention. This convention will be very mission-focused and the schedule will reflect that. We will have a more condensed time for business than we usually do so that we have the time we need for learning and conversation. To help us continue our work on innovation and collaboration, we have invited the Rev. Canon Scott Slater to be with us. 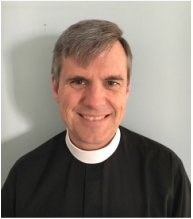 Scott has been an Episcopal priest since 1993 and has served in the Diocese of Maryland since 2001. Following nine years as rector of Church of the Good Shepherd in Baltimore, he began serving on the bishops’ staff as the Canon to the Ordinary in July of 2010. In 2015, he became a Certified Daring WayTM Facilitator based on the work of Brene Brown, Ph.D. He will be leading us through a program relating to issues regarding shared ministry, both on the diocesan and congregational levels, using the work of Brené Brown. Please see below for links to videos from Brené, as well as to some of her books. If you are able, we would encourage you to take the time to look at some of her work prior to convention. We urge our clergy and delegates to come ready to engage in these conversations. Please do not use the condensed business time as an excuse to not attend the entire convention. The work that we will be doing at the convention, though not the conventional business, will be setting the table for the future of our diocese. We would also encourage those laypeople who are not delegates but who are interested in being a part of this conversation, to please join us as well. We will have plenty of space for those who would like to join us and we would love to have you there. This entry was posted in Convention, DioWNY, Events, One Church and tagged Brené Brown, collaboration, Convention, Convention 2017, DioWNY. Bookmark the permalink.